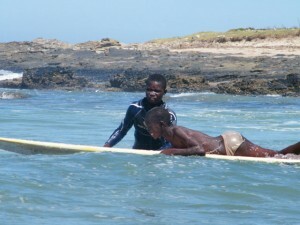 The last two Saturdays Thobile has taken the local boys that have been collecting litter and helping in the garden for their first surfing lessons on Coffee Bay beach. Thank you Clare Harding for donating your board to us! 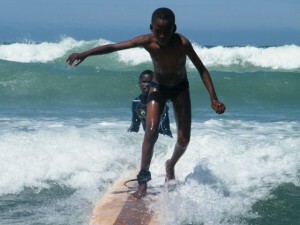 And thank you Charlie for the use of your long board. 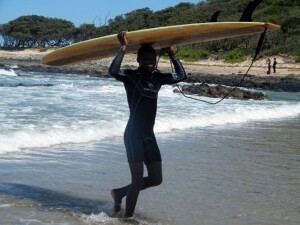 The weather was really good, there were some big waves but we surfed the small waves near the beach. First I took Tsephe. He is doing really good and he stood up straight away.Next was Luntu who was also really good. He was fast. 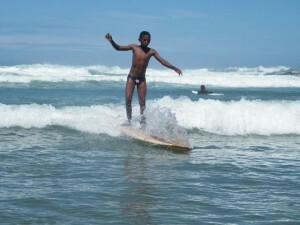 Bernarti, Tsephe and Luntu were all really good, even on the smaller board when they were practicing. Lukholo was too cold but he tried and next week he will do more and we will hope to find him a rash vest or something. It was really nice and I am very proud of them. 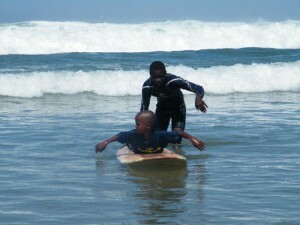 The whole day was very nice and I am looking forward to doing more surfing with them next week. Good to see Toby is still out there shredding! Keep teaching the others and feed the stoke young man! Hello Toby and the rest of the Coffee Bay Crew! Keep well! We miss you and the waves!